The Spare Air "Xtreme Sport" Neoprene Vest is the outer garment that is worn when using a 1.7cf or a 1.1cf Spare Air to perform self-rescues and to save others where only a few extra breaths are necessary to prevent drowning. 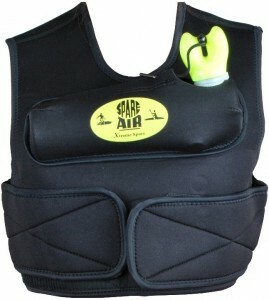 Over the years, kayakers, surfers and other water-sportsmen have been using the Spare Air as a rescue safety device. Their only complaint.... they needed something that was "hands free". The "Xtreme Sport" Neoprene Vest solves this by mounting the unit in a chest pocket. Now your next breath is only inches away. The "Xtreme Sport" Vest is constructed of warm 1/8 inch neoprene and comes with an easy to adjust side velcro belt along with a secure pouch with an outlet for your regulator mouthpiece. Wear the vest under a PFD and/or outside any other clothing for easy access. Please note that this sale is for the "Xtreme Sport" Spare Air Vest only. The Spare Air Tank or any of the Spare Air accessories as shown in the photos are not included in this particular sale and are shown for informational and educational purposes only. Click the button below to add the Spare Air Xtreme Air Neoprene Vest to your wish list.